Frank's Cafe and Campari bar, the al fresco pop-up venue on top of a multi-story car park in Peckham that succeeded in luring the hipsters of London down to SE15 last year, is to re-open this week. Bold Tendencies, the sculptural art project, is also returning for its fourth year in the upper storeys of the part-abandoned multiplex car-park. But judging from the reaction last year, it's the attraction of sipping a drink and nibbling braised cuttlefish and crab on toast while watching the sun set over London that's most appealing. 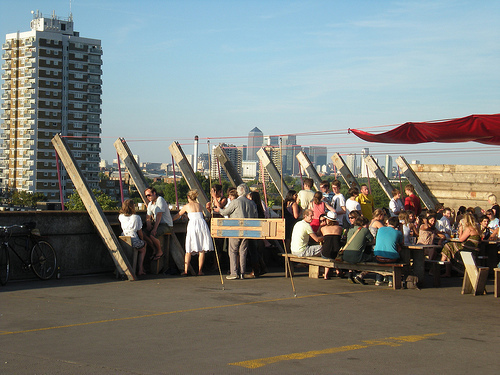 The bar is located on Level 10 of the Peckham multistorey car park, 95a Rye Lane, SE15. It (and the exhibition) will be open Thursdays to Sundays, 11am - 10pm, from July 2nd until September 30th.